I know I just said I'm not big on New Year resolutions but I came across something the other day that made me think of them in a different light. If you follow me on pinterest, you saw Woodie Guthrie's resolutions from 1942. There are so many simple, doable things on his that serve as great daily reminders of how to live. 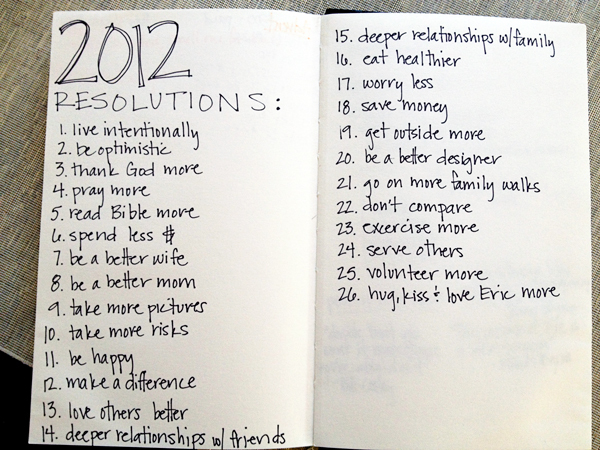 I used his resolutions as inspiration for my own daily reminders for my life in 2012. Did you make any resolutions, goals or reminders for 2012? I love your handwriting. ;) make it into a font please. I am so in love with list, and I'm sharing it on my blog today! Hope you don't mind :) Thanks for the inspiration!